- ALL-IN-ONE SET - THE PERFECT GIFT! Made using Rotmarder sable, this extremely fine and pointed brush is perfect for painting ultra precise highlights, facial tattoos or just insane details. The most versatile brush in our line-up, the Regiment brush is ideal for speed painting large batches of troops really fast! Its Rotmarder sable hair holds a fine tip for more detailed work. This innovative drybrush is set at a 43º angle - the perfect angle for dry brushing small areas of the models like chainmail, facial hair or a weapon! With the Mega Brush Set you get the very best Wargames Brushes available - fulfilling every aspect of painting! In the set you get one each of the following brushes: Insane Detail, Detail, Character, Regiment, Stippling, Monster, Small Drybrush, Large Drybrush, Vehicle, The Psycho and in addition the black handled Masterclass Brush for free. As far as product value goes, this sets is an absolute high-score. Contains a special Plastic Frame cutter with extra fine point for precision work, a scalpel knife for removing flash and cutting plus a 20ml of The Army Painters amazing model Plastic Glue. Everything you need to get you started on assembling those plastic regiments. Also included is a FREE tool guide. all you need to wreak havoc on the battlefield is in the Wargaming Set all in one quality ziplocked case making sure that you never lose your command tools. 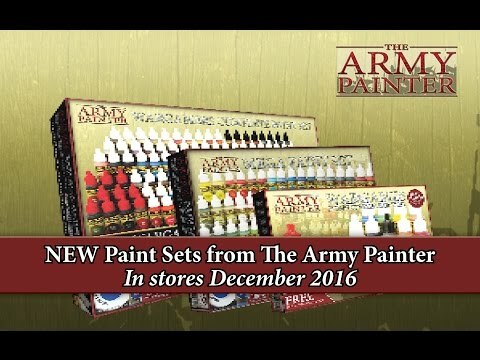 This exceptional wargaming Hobby Set has everything you need to start your next miniature Project! Includes: 10 Warpaints, 3 hobby brushes, 1 knife, 1 file, 1 precision side cutter, 1 cutting mat and all 3 glues.